Your institution can select one of three methods (Controlled, Uncontrolled, or Both) for faculty to enter committees in FACULTY180 (see Set Up Foundational Areas). If Controlled is selected, your institution will need to develop a list of committees. The committees can then be entered manually, or the list can be uploaded to FACULTY180. Click Committees in the School section. The Committees screen displays. Select the desired unit designation for the new committee. 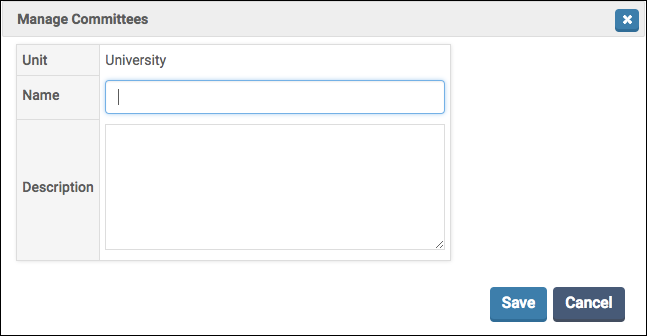 Make sure Controlled is selected as the Input Form. Click Add. The Manage Committees dialog box opens. Enter a name and description for the new committee. 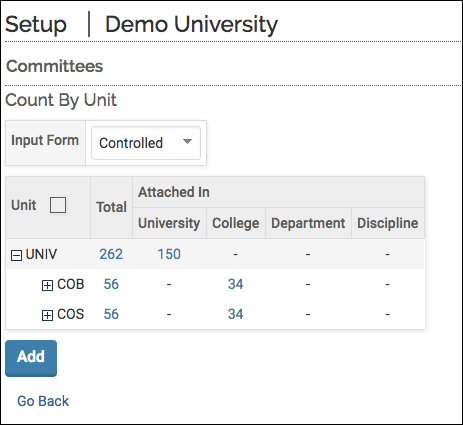 For information about uploading a list of controlled committees to FACULTY180, see Upload Base Data. Click Committees in the School section.The Committees screen displays. Select the desired unit designation. The Manage Committees screen displays. Committees can be edited and made inactive from this screen.